We offer classroom instruction and keynote versions of our courses. Our keynotes are perfect for offsites or group meetings where you’re looking to bring in an interesting perspective from outside your organization. 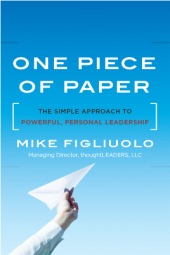 One Piece of Paper: The Simple Approach to Powerful, Personal Leadership by Mike Figliuolo defines the four aspects of leadership our courses focus on. Those four aspects are listed below. For each course the corresponding aspects of leadership the course addresses are indicated by the icons. We believe leaders must achieve balance across all four of these aspects – that’s why we teach courses to build skills in all of these areas. Please contact us to arrange for us to deliver classes, presentations, or keynotes at your organization. Click on a course to get the full description.